Most "Occupy Wall Street" protestors say they have a problem with corporate greed, unfair taxes and economic inequality, which results in 1 percent of Americans owning 44 percent of U.S. wealth. And while many say they're standing up for the little guy, they sure have a funny way of showing it. Area businesses nearest to New York's Zuccotti Park, the protest's unofficial campgrounds, say the rally is hurting business. 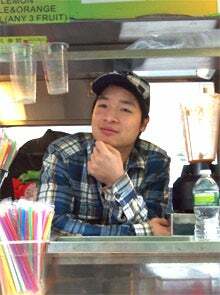 Smoothie vendor Zhi Wang, says business has slowed since the Occupy Wall Street protest started up in New York on Sept. 17. "People used to come down for their lunch, now the people aren't coming down," says Zhi Wang, a smoothie cart owner stationed at the edge of the park. He pointed at the surrounding skyscrapers, which house some of the world's largest financial institutions and the Nasdaq Stock Market's headquarters. The number of other businesses facing similar hardships is unknown. The New York Police Department was still tabulating complaints and didn't know how many had come in at the time this article was published. The Mayor's office didn't return multiple requests for comment. But anecdotally, at least, the damage from protestors has been considerable. In a restaurant just off the park, a protestor broke a bathroom sink while trying to bathe in it, according to the restaurant owner, who asked to not be identified for fear of reprisal. Demonstrators have been streaming in, asking for hot water, plastic bags, paper products and to use the bathroom. But when one broke the bathroom sink, trouble began. Related: What Does Occupy Wall Street Mean for Your Business? She tried to limit bathroom use to only paying customers, and protestors threatened to boycott, she says. She decided to shut down the restroom. "I've been here eight years and I've never had to lock the bathroom before," she says. "I'm so frustrated... They could be here through winter. I'm not sure what I'll do." She says she complained about the protestors to the Alliance for Downtown New York, which manages the downtown business improvement district. That organization refused to comment on the impact protestors have had on local businesses. As of yesterday morning, Occupy Wall Street has logged more than $35,000 in donations. Still, some area businesses including a Burger King store and a Pizza place say sales have picked up since the protest began. Foot traffic is up. A false rumor that rock band Radiohead would play a surprise show on Friday drew hundreds -- if not thousands -- of people, while many more tourists and onlookers pass through in droves each day. 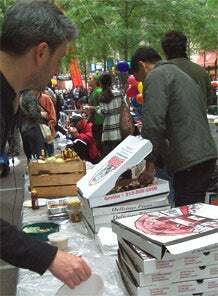 Inside the park, sympathizers have donated pizza pies, eight-foot submarine sandwiches, donuts and even an Edible Arrangement. As of 9:45 a.m. Eastern yesterday, the movement had attracted more than $35,000 in donations, according to Occupy Wall Street organizers. And more items such as sleeping bags and clothing were on the way, says activist Thomas Flessas, who helped pass out food to hungry protestors. On his drive up to New York from Tampa, Fla., earlier this week, Flessas says he stopped at places along the way to recruit others to join the protest. "It's our contribution to the cause," he says.